Here in Australia, it is a legal requirement that your swimming pool is appropriately fenced before it can be filled with water. The good news is that Pools R Us can arrange for the installation of swimming pool fencing in Melbourne to coincide with the construction of your pool, ensuring that it’s ready to go at completion. The minimum height requirement for all fencing installed around a swimming pool is 1200mm. This measurement is taken from any ground surface (including rocks that may have been used during your landscaping), so it’s important to ensure that it reaches a height of 1200mm all the way round. We have found that aluminium pool fencing in Melbourne is quite a popular choice, as it is available in hundreds of powder coat colours (allowing you to complement other features around your property) and is highly suited to use in overly wet environments (as aluminium is corrosion resistant). It also doesn’t require much maintenance – giving it a wash two to four times a year with a detergent solution is often sufficient. 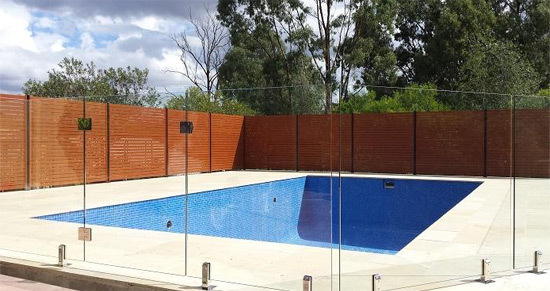 Glass pool fencing in Melbourne has been steadily growing in popularity over the years. There are three options to choose from – framed, semi framed and frameless – allowing you to achieve the exact look that you desire. In terms of framed and semi framed fencing, the posts are comprised of powder coated aluminium – simply pick the colour you most prefer. One of the great things about glass is that it’s relatively low maintenance. When it comes to tubular fencing in Melbourne, we generally have two material choices – aluminium (which tends to be the most popular) and steel. The tubular look is a fantastic choice for any pool, as it keeps the area secure without completely blocking an outsider’s view of the water (and vice versa). It can also be powder coated or anodised in the colour of your choice, ensuring that the fencing will complement your property. Pools R Us can provide pool fencing for projects that we complete across Melbourne and the Mornington Peninsula, including: Rosebud, Rye, Mount Martha, Rowville, Glen Waverley, Mount Waverley, Sandringham, Pakenham, Cranbourne, Narre Warren, Dingley, Sandhurst, Aspendale and Frankston. Is glass a safe material to use as fencing? Only toughened safety glass is used in fencing applications, ensuring that it's durable enough to withstand the elements and most impacts. In frameless fencing, the panes will be 12mm thick. In semi-framed and framed fencing, the panes will be 10mm thick. Make sure that the glass is certified for Australian Standards; a certificate can sometimes be required. Is aluminium suitable for use around a pool? Many homeowners are hesitant to use metal in their swimming pool areas because they're worried about corrosion. The great thing about aluminium is that it doesn't rust and, once it has been powder coated, it will resist corrosion far better than many other materials. How much maintenance does fencing require? No matter which material you have selected – aluminium, glass or tubular - you'll be pleased to learn that it won't require much maintenance. Give the fencing an occasional wash (every 3 to 6 months) with a mild detergent solution and regularly check it for signs of damage.